No compensation was received for sharing this new product and giveaway with 3G2S readers. Two things I've always told my husband that I wished we could get delivered to the house are large bags of dry cat food and cat litter. They are both so heavy and take up so much space in the trunk of our car. This is one of the reasons why it is my husband's job to buy the litter and to change the litter in our extra-large multi-cat litter box. It's actually been his job for nearly two decades. Well, he'll be so excited when he finds out that those chores may not be his sole responsibility for much longer. 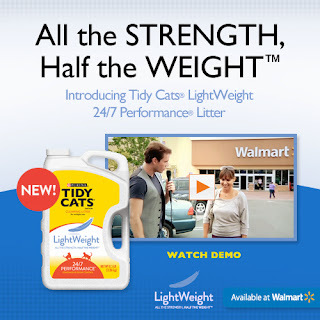 Tidy Cat's new Lightweight 24/7 Performance Litter offers the same performance as regular scoopable Tidy Cat brand litter, but at half of the weight! Now, if only someone would develop a cat food that is 50% the normal weight . . . Enter the giveaway below for your chance to win one of two $25 Walmart gift cards. That's enough for you to buy some new Tidy Cat Lightweight 24/7 Performance Litter and to pick up a little something extra for yourself! US only, contest ends on 11/29/13, please whitelist momdot@live.com to ensure contest prize delivery email. This is a multi-blog giveaway. 3 Garnets & 2 Sapphires is not the administrator of this giveaway.